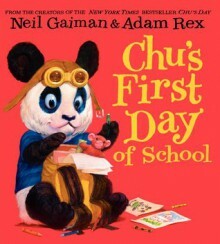 A brand-new picture book adventure about the New York Times bestselling panda named Chu from Newbery Medal-winning author Neil Gaiman and acclaimed illustrator Adam Rex! Chu, the adorable panda with a great big sneeze, is heading off for his first day of school, and he's nervous. He hopes the other boys and girls will be nice. Will they like him? What will happen at school? And will Chu do what he does best?Chu's First Day of School is a perfect read-aloud story about the universal experience of starting school.Supports the Common Core State Standards.